We help you have fun picking out a cool dog collar and leash for your best friend. 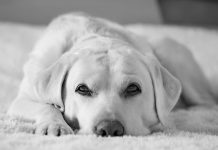 We look at the different types of dog collars and leads available for Labradors and other large breed dogs. And give you help and advice in making the right choice. Use the green menu to jump to the type of collars or leashes you are interested in. Or just scroll on down and enjoy the ideas we have put together for you! 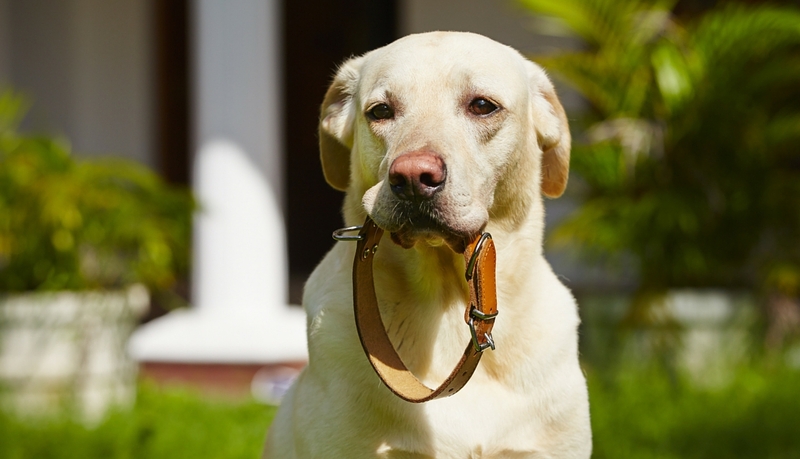 Dog collars are an essential accessory for most Labrador owners. They hold his ID tag, they are where you attach his leash, and they can make a real statement about you and your dog. In the USA most states require your dog to be licenced, but the rules on this and displaying details on a tag differ depending upon where you live. To find out what the rules are in your local area, you can check out your local authority’s website. Failure to put proper identification on his collar could potentially lead you to a hefty fine. A sensible recommendation regardless of where in the world you live however is to have your name, house number and postcode, then mobile phone number displayed. This will enable anyone who finds your dog to contact you or bring them home, and will potentially stop you getting into trouble too. You want to choose not just the best style of dog collar, but the one that is the most comfortable, practical and suits your dog the best too. Remember, before you begin your search measure your dog’s neck carefully. Labs come in a big range of sizes, and collar manufacturers all put their sizing in slightly different brackets. One brands medium is another brands extra large. When your Labrador is small he will still need a collar, but it won’t be quite like the ones he will wear when he’s fully grown. For a Labrador puppy collar, you’ll want something softer, thinner and much lighter for his growing neck to support. The Blueberry Puppy Collar range are a great choice for any breed, even bigger pups like Labs. They are easy to clip on and off, light-weight but still sturdy and durable. They come in a range of fun colours and designs, and you can get matching leashes and even harnesses to go with them too. If your labs love the water as much as ours do, smelly collars can be a big problem. One of our top favorites is the Ruffwear range of waterproof dog collars. The one inch collar is coated to protect the webbing, and keep it ‘stink proof. The Ruffwear Headwater dog collar looks really smart and comes in several cool modern colors. We are big fans of waterproof collars and and we think you will like them too. Leather dog collars are a very popular choice amongst us Labrador owners. They are definitely my collar of choice for our three year old chocolate Lab, Rachael. There are numerous leather collar choices available, but we think the following stand head and shoulders above the rest when it comes to our large breed dogs. Perri’s Padded Leather Dog Collar is a very popular and well received choice. It has the sturdy, durable leather collar in a traditional style, complemented by very soft lambskin inner padding. The inner padding comes in a range of colours, from very discreet dark to bright and funky. It is very well made and should keep your dog looking good for months and even years to come. You can find out more and read the hundreds of positive reviews online here. The Rosewood Luxury Leather Dog Collar is a simple, stylish design. The leather is soft and comfortable for your dog to wear, but with a durable, robust finish. You can take a closer look at this lovely collar here. I have been really impressed by the Hamilton Creased Leather Dog Collar. Not only does this come in a range of lengths but you can choose varying widths as well. Making it easier to find one that suits your dog down to the ground. It comes in black or burgundy leather finish, and each collar is strong and durable. Stitched together with weather resistant thread so that it stays in great condition for longer. These collars are available to buy individually or in a set with a matching leash too. Please note that the length measurements refer to the collar and not your dogs neck – so take this into account and choose a size bigger. You can find out more about this collar online here. Designer clothing and accessories have made a real mark in the pet world. 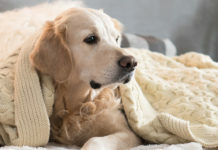 There are some really gorgeous choices when it comes to getting something eye-catching and great quality for our dogs just like we would want for ourselves. Our favourite designer dog collars don’t just look great though. They are durable, functional and stand up to our big, bouncy Labradors’ enthusiastic use. The Chocolate and Cream Designer Luxury Dog Collar is a great choice for the discerning Labrador. Not only is it designed for large dogs like Labradors, it is soft, comfortable and stylish too. The faux leather dollar is backed with polyester, and includes a small paw charm on the D ring. It can even come with a matching dog leash. Find out more about this gorgeous designer set here. At the other end of the designer spectrum we are also crazy about the Blueberry Pet Dog Collar range. These fun dog collars look really cool. They are made of high density polyester, which gives softness as well as durability to the design. The buckles are made from ecofriendly plastic and the metal D ring is nickel coded for added strength. You can check out the range of colors and sizes for these fun designer dog collars here. There is a real splash of color injected into the dog collar world at the moment, and we are loving all of the fun, cheerful designs and bright colours. Enough to cheer up the chilliest morning dog walk. The Red Dublin Dog Collar is sure to get everyone at the dog park talking. It’s made to last and glides easily onto your dog’s coat with no fuss. It is also 100% waterproof and easy to clean in warm water when you get home from a muddy walk. It will stay looking and smelling clean for much longer. You can find out more about this range of colors here. We also love the Lupine dog collar range. 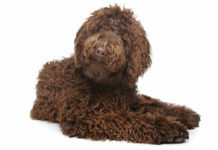 They are fully adjustable, and will fit even the biggest breed of large dog. They also come in a range of colors, from plain to fun and funky patterns. Not only that, the manufacturers are so confident of their durability that they are guaranteed, even when chewed. Find out more about this great range of collars here. At certain times of year you will probably find that you need to take your dog out after dark. It might be only 5.30pm, but it’s pitch black outside and your black Labrador is a speck in the gloom. To help keep him safe and your worries to a minimum, why not invest in a high visibility collar? The LED Dog Collar takes visibility to a whole new level with Light Emitting Diodes. They glow in the gloom and flash when it gets really dark. Meaning that you will always know where your dog is even in the park at night. It even has a remote control so you can change the speed or emission of the lights without even being right next to your dog. This collar is easy to put on your dog and comfortable for him to wear too. You can find out more information about the LED collar here. When you take your dog outside your home and garden, you will need to have an I.D. Tag attached to his collar or harness. This dog collar tag can be something simple and discreet, or bold and flashy. Here are some great options to suit any Labrador owner’s taste, starting with personalised dog collars. There are lots of options for dog I.D. tags. Personally I really like the plain traditional look when it comes to tags, and the Stainless Steel Pet IDs from GoTag are a very popular choice. They are strong and wear resistant, with plenty of space to have your dog’s essential information added on. They also come in a range of shapes from circular, to bone and even heart shaped designs. The ordering process is straight forward and they even come in a choice of two sizes, so you can get your preferred version. To find out more about the GoTag stainless steel pet ID click here. If you would like something with a bit more colour then why not check out the amazing range of Pet ID Tags by Providence Engraving. They come in not just a range of shapes from stars to bones, but in a lot of different colours too. They are also very well reviewed online, which gives a lot of confidence in buying! Find out more about these dog ID tags here. Our final top choice are the personalised engraved glitter pet IDs. These vibrant, fun dog tags are in the shape of a paw and covered in your choice of colored glitter. Find out how to get your paws on one by clicking here. You don’t have to use a separate dog tag to show your dog’s identification details on his collar. You can buy them already combined. These custom embroidered dog collars are embellished with your dog’s name and your phone number. Although if you are not comfortable having his name plastered all over his neck you might like to get your surname put there instead. This dog collar comes in a range of colours so you can choose the one that you like best. They aren’t just practical, but great quality too. These slide on tag collars are an easy way of getting your dog’s collar and I.D. tag sorted in one go. The tough nylon collars come with an engraved tag which simply slides onto the collar. This has the added benefit of not waving around on your dog’s chest or making a clunking noise as it bounces against the D ring as he runs around. You can find out more about this personalised collar option here. So now that you have found your perfect dog collar, you will want a functional but fabulous lead to walk him on to. We have put our favourites into a few handy categories for you to help you choose your preferred design. Traditional dog leashes either click straight onto your dog’s collar or harness, or work independently like the slip leads worn predominantly by working gundogs when out in the field. 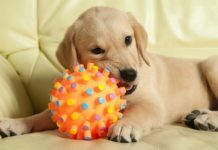 Which one you choose will depend upon what you and your dog like best, and slightly on the activities you take part in. Biothane is THE hot new material for dog leashes. And perfect for mud loving Labradors! Light and waterproof, a biothane leash won’t absorb odours and is easy to rinse clean. In addition to the smart black 6 foot leash illustrated, they come in a wide range of other colors, widths, and designs. If you have a leather dog collar then you might well want a matching leash. The matching set to the popular Perri’s collar we looked at above is this padded Perri’s Dog Leash. These top quality leather leashes were made in the USA. They are a high quality leather padded with soft lambs wool. They also come in a range of gorgeous colours, so you can pick one matching your colour or have a fun contrasting look instead. Find out more about these great dog leashes here. The Timber and Tie Leather lead is a plain leather lead with solid brass fittings. It is universally simple and yet of a very high quality. Meaning it will hold up to frequent use and match any collar you choose well. It can even hold up to the bad weather, as it is made without stitching. A great option for a similar plain leather design is this Signature K9 Heavy leather leash. It’s strong, durable and even has bevelled edges for hand comfort. These hand crafted leads are stitched with extra strong thread and double riveted for a secure finish. Rope dog leashes can be very practical as they are strong and durable. The ZippyPaws Climbers mountain rope dog leash is especially hard wearing as it is made from professional climbing rope. It is extra durable with a very high tensile strength, ideal for large dogs. It is also comfortable to hold in your hand, and has a sturdy snap hook that adds to the security of the structure. It also comes in a range of colors and lengths. You can find out more about the ZippyPaws Climbers mountain rope dog leash here. Nylon dog leashes are a very popular choice. They can come in a range of colours and styles, are long lasting and easy to hold onto. Not to mention sturdy and durable, to keep your dog safe and secure when out walking. If you are looking for something tough and durable for a strong, large dog then check out the Primal Pet Gear heavy duty leash. It is 100% nylon, thick and long. Guaranteed to be comfortable to hold even with a dog pulling hard on their harness. It even has reflective stitching for increased safety on those early morning or late night strolls. Find out more about the Primal Pet Gear leash here. Another great choice for owners of large boisterous Labs is the Pets Lovers Club Durable Dog Leash. It was designed with outdoor pursuits in mind, ideal for large breed owners who love walking, hiking and training their dogs. Not only is it strong and durable, it is made from eco-friendly components too. So you are doing your bit for the environment as well as your dog. It is made up of two layers for increased stability which is still fairly light weight to hold. The handle is also soft, helping to keep it in one piece if your dog decides to dance around a bit! It also comes in black, blue or red so you can pick the colour which you like the best. Find out more about this great leash choice here. When your dog is still young or in training a training lead is a great way to manage his behaviour without using punishment. It gives him a degree of independence whilst you are still actually in control of the situation. These come in a range of lengths, depending upon the training activity you are carrying out and where you expect the dog to be in relation to you. The most common sizes for training leashes to be used outdoors are 30ft or 50ft. Dog slip leads consist of one piece of rope which is looped around your dog’s neck. They are best used on fully trained dogs, when out in the field. To give your dog some added safety when at heel, but to then let them off unencumbered into the undergrowth to work. I wouldn’t recommend a slip lead to someone with an untrained dog or one that pulls on the lead, as the noose can tighten around their necks when they rush forwards. For the trained dog however, our slip lead of choice is the Mendota Slip Dog Lead. It has a leather stop which prevents it tightening around your dog’s neck too strongly. It is also sturdy and durable, and should last you for many years. You can buy yours in the traditional green or choose from a range of fun colours instead. Find out more about the Mendota Slip Dog Lead here. Don’t miss The Happy Puppy Handbook. The book will help you prepare your home for the new arrival, from what to buy, where to buy it, to what to do and how to do it! 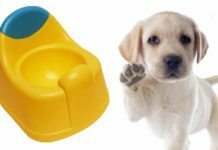 It will also get you and your puppy off to a great start with potty training, socialisation and early obedience. My name is Emily. I love to read these article and it is very informative. I bought a collar (from barcelonadogs.com) for mah little cutie “Shadow”. he loves it. Thank u again “The Labrador Site” to guide us for puppy collar. My 16-week old fox red lab is constantly biting and pulling her leash. A few people have suggested we try a chain leash for her. Do you have any recommendations? I need something my Lab can not get out of every time i hook her up out side. she gets loose and runs and rolls in nasty smelling stuff. great article , i personally find that harnesses are the best option as they keep the pressure off the dogs neck and are more supportive in general , I also find they are much easier to manage if your dog is pulling. Many dog owners only put the dog’s name & a phone number on the tag – this is unlawful. You can fit this on most tags, it complies with the law & a mobile number is practical in case you & your dog become separated whilst out. Thank’s Nige, we’ll clarify that when we update the article. I have two 7 month old Lab and Roc mixed puppies and they have eaten through at least 4 collars and leashes a pease. They jump on people trying to play all the time. They break out of their cages and destroy everything in site. They have destroyed the catch tray is their cages. They did holes. I don’t want to punish them so how do I correct their behavior. I need help. I have two lab and roc mixed puppies they have eaten their collars, leashes toys, bottom of their cages, broke out of their cages and torn up everything in sight. I had them in the house but they keep going to the bathroom in the house. They jump up on people, dart out the door dog holes, wrestle, they are about 7 months old. I have bought I know at least 4 collars a piece. I don’t know what to do to calm them down. Help! Good review of a selection of leads and collars although not much practical information included. I would like to use leather collars but Lily spends much of her time at the beach and the sea salt ruins the leather and corrodes any metal buckles. I tend to use the polyester collars with plastic snap buckle and make sure they are washed daily especially the metal ring and tag. I have a chain collar for my black lab – it is a choke chain collar though I never use it for that purpose. Would you recommend these? I like the Roc lead. It has a really easy to grab padded ‘traffic’ handle incorporated near the collar attachment Then a powerful stretch section which is designed to absorb the shock when your lab suddenly dives towards something of interest! This feature has really helped my arthritis as I am no longer jarred and still in control. It also has a very comfortable padded handle. My Bosun seems to enjoy the lead too, it restricts him reminding him he is on a lead without discomfort. 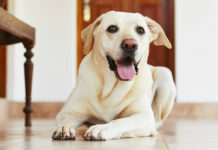 As a soon to be owners of two Polar White Labs, I appreciate your post on collars and leashes. The one additional question I had, what are your feelings on harnesses? Are they better than traditional leashes? Or maybe not? Thanks for the website. It’s been so helpful in getting ready for these two wonderful puppies. Hi, I don’t use collars for leading …just a gentle leader and harness. I have found the constant tugging on the neck is not good for dog. I also so use a runners leash so I keep his leashed at my waist to keep my hands free for correcting and prevents shoulder arm injuries for me. It’s so much easier for my lab who is constantly hunting and sniffing the ground…he has more freedom, I have more control. I use a harness on my 10 month old Lab, Dora, but am having trouble stopping her pulling, especially when she sees another dog, Would she be better with a collar? What about vest collars? Honeybear keeps chewing through these regular types of collars.